Whenever life takes us to the Hudson River Valley, our dear friends Biliam Van Roestenberg of Liberty View Farm and Agnes Devereux of the Village Tea Room host a spectacular dinner and we all invite friends from the area. 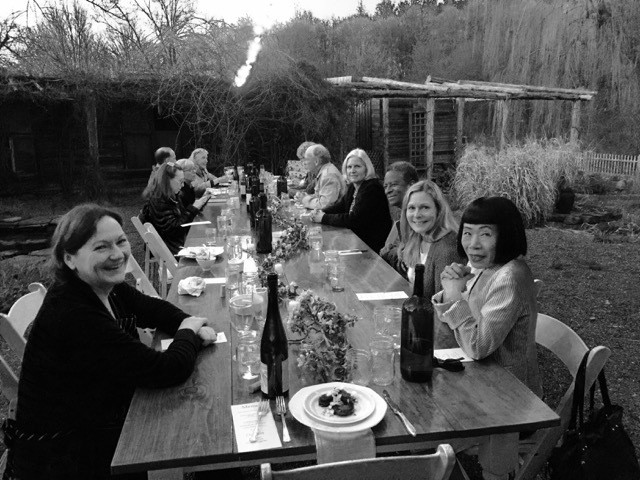 The warm spring weather enabled us to dine outdoors with a view of the apple orchards in full bloom! This month, we were once again presenters at the International Wine and Food Festival at the Mohonk Mountain House. By happy coincidence, Sara Moulton was also a presenter so she and her husband Bill Adler were among the dinner guests. (We each bought and personalized each other's newest books.) 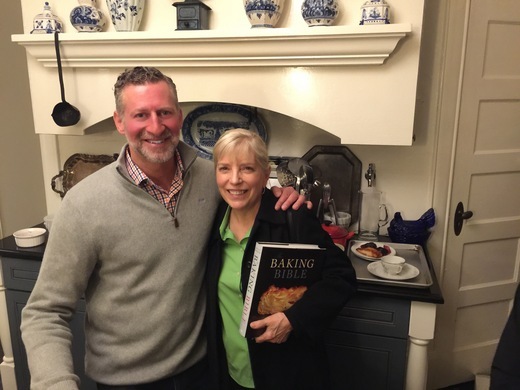 And we were delighted that Nina Smiley, of the Mohonk Mountain House could join us. We learned that she had just started a Wellness program which includes meditation, T'ai Chi, and "forest bathing." When we were in Vancouver for Nathan Fong's wedding, we met fellow award winning author Hiroko Shimbo and discovered that she and her husband Buzz have a house near New Paltz so they were also invited guests. Coincidentally, Hiroko was just featured in Sara's beautiful new book Sara Moulton's Home Cooking 101. 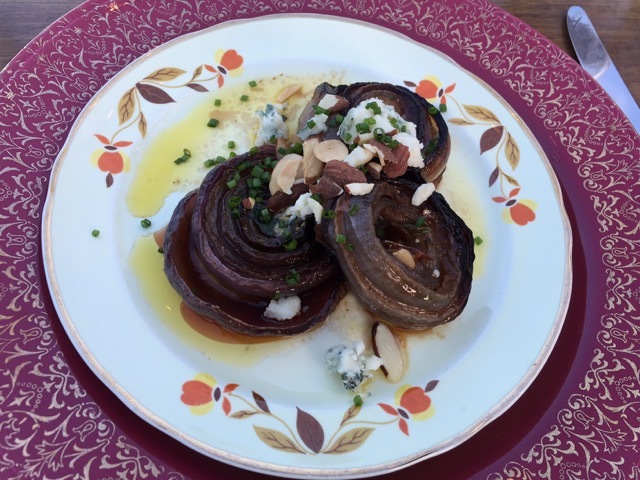 Sara Moulton's Home Cooking 101: How to Make Everything Taste Better Agnes prepared a delicious dinner beginning with warm roasted red onion salad with ewe's blue cheese and a sherry vinaigrette. 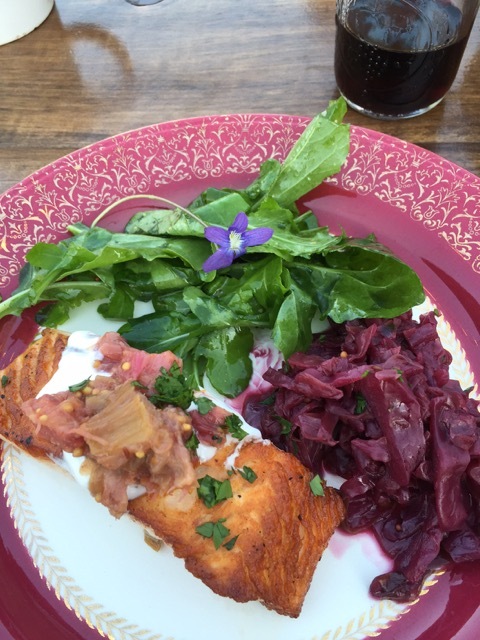 The main course was pan roasted salmon with rhubarb relish and Hawthorne Valley yogurt, accompanied by an amazingly delicious red cabbage braised in rhubarb, and a local arugula salad with stone ground mustard vanaigrette. 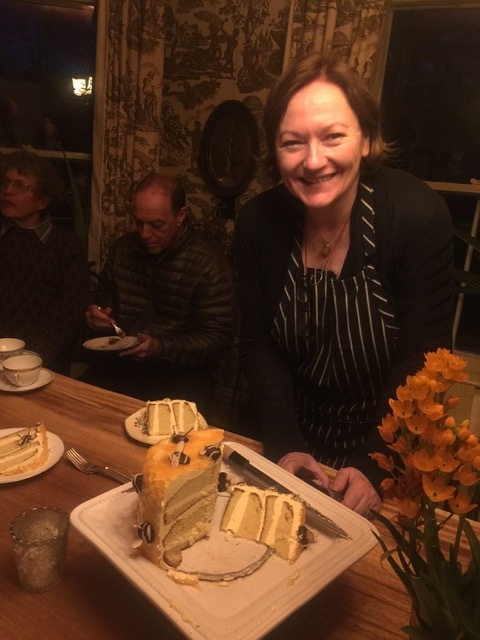 Once the sun set the temperature began to drop so we enjoyed dessert indoors: Agnes's signature Honey Bee Cake (which she says was inspired by my Honeycomb Chiffon Pie from The Pie and Pastry Bible). She also served pastry cream filled cream puffs and Orchard Hill Cider Mill Ten 66 Pommeau.